on january 12, farmers gathered in large numbers in Multai in Betul district, Madhya Pradesh, demanding compensation for crops damaged by severe rain and hailstorms. Unable to disperse the crowd, the police opened fire without warning, killing 19 and injuring around 500 people. Described as "more gruesome than Jallianwala", the tragedy underscores what the callous indifference of the Union government in disbursing disaster relief funds can bring about. The year gone by was a tragic year for Madhya Pradesh. First there was the earthquake in Jabalpur. Then, heavy monsoon caused floods in Rewa, Sidhi, Balaghat and Satna districts. In other districts the monsoon failed. Unprecedented hailstorms and excessive unseasonal rainfall in winter devastated agriculture in major tracts in the state. Soybean and paddy, which are sown in July, withered in severe drought or were inundated in floods. Where rainfall was normal and the two crops survived, another blow was dealt to farmers at the time of harvesting. First, the late monsoon rains delayed the harvesting. Then followed a series of hailstorms all over the state in October and November, interspersed by heavy rains. The rains which continued from October to December, damaged sown crops, delayed timely sowing or forced second sowing of other crops. While the farmers were distressed and the government bewildered, the scientific community was unable to explain the reasons for frequent changes in weather. Monsoon in Madhya Pradesh normally withdraws by September 14. Mild rains in December, called "Mahawat", are beneficial for the rabi (winter) crops. Hailstorms are rare, brief and usually limited to small pockets. But the hailstorms which occurred towards the end of 1997 were unprecedented. In villages around Bhopal, some 400 people suffered serious injuries from hailstones. More than 13,000 houses were damaged. 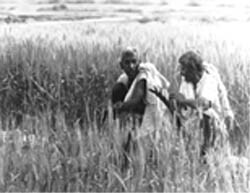 Government estimates put the kharif crop loss at 25 per cent. The farmers, however, say that about 50 per cent of the soybean and paddy crops was lost. In the Chhattisgarh region, known as the 'rice bowl of Madhya Pradesh', frustrated farmers spread their paddy crop on roads so that they would be pressed dry under the wheels of heavy vehicles. Between October and end-December, 40 of the 45 districts on average received up to 338 millimetres (mm) of rainfall. Bastar district, which has a 'normal' winter rainfall of 115 mm, received 223 mm. The state government, on its part, announced several measures to provide relief to the farmers. It waived off the land cess (lagan) and postponed the recovery of irrigation tax. In villages where production was less than 37 per cent, all short-term loans were converted into mid-term loans. To farmers affected by hailstorms, the state government distributed about Rs 18 crore as relief. Another Rs 20 crore has been earmarked as seeds loan, which has been doubled from Rs 1,000 per farmer to Rs 2,000. S R Yadav, the agriculture minister of Madhya Pradesh said that such widespread crop damage has never been witnessed in Madhya Pradesh. Only if the Union government steps in can the state government provide additional relief, adds Yadav. The state chief minister, Digvijay Singh, said that in December 1996, he had requested the Union government to provide a total assistance of Rs 1,922 crore for dealing with natural calamities. To deal with the losses caused by excessive rains, the state government had requested another Rs 1,222 crore from the Centre. But the Centre provided only Rs 45.26 crore for earthquake relief and did not grant any other funds for disaster relief. The state government has said that it would purchase the damaged paddy that remains unsold on support price. Farmers in this largely rural state - whose production is far below states like Punjab, Haryana, Uttar Pradesh, Maharashtra and even Gujarat - are in a bind. With the cash-strapped state government unable to adequately compensate the losses and the Union government unmoved, their woes are likely to stay for a long time.